The obverse shows a ring of perlucor, enclosed by a silver outer ring, with a silver curved image of the Earth featuring geophysical map of the world in colour print at its centre. The silver outer ring carries the inscriptions 5 EURO and LATVIJA at the top and bottom respectively. The reverse shows a ring of perlucor, enclosed by a silver outer ring, with a silver curved image of the Earth featuring geophysical map of the world in colour print at its centre. 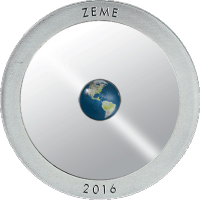 The silver outer ring carries the inscription ZEME and the year 2016 at the top and bottom respectively. Humans have always wanted to understand and explain their surroundings and the world. The shape and structure of the Earth have been portrayed from the viewpoint of each century. In ancient times, the idea predominated that the Earth was flat, with its disc supported by four elephants or three whales, which, in their turn, stood on the back of a huge turtle. The role of a support or mover was also entrusted to a gigantic snake or dragon. The ancient Chinese were sure that the Earth was a rectangle with a semi-spherical dome of the sky from which silver stars were hung. The ancient Greek philosopher Aristarchus of Samos (ca. 310–230 B.C.) came to the conclusion that the Earth revolved around the Sun. He developed a heliocentric system, albeit the inability to provide mathematical proof meant that heliocentrism simply remained an assumption. Anaximander (ca. 610–546 B.C.) already treated the Earth as a part of the Universe, and Pythagoras (ca. 580–500 B.C.) was among the first to propose the idea that the Earth was round. Yet the civilised world managed to forget this clever conjecture for centuries. In 1230, professor Johannes de Sacrobosco (1195–1256) of the University of Paris revived the presumption of the spherical form of the Earth in his treatise Sphaera. This point was borne out by the discoveries of the great explorers Christopher Columbus (1451–1506) and Ferdinand Magellan (ca. 1480–1521) who also brought home the observation that the Earth was much larger than once thought. The Polish astronomer Nicolaus Copernicus (1473–1543) concluded that the Sun was at the centre of the Universe, and the Italian scientist Galileo Galilei (1564–1642) managed to prove that all the solar system planets revolved around the Sun. The English scientist Sir Isaac Newton (1643–1727) provided an explanation for this by discovering the universal law of gravitation (1682). For the first time, people could see the shape of the Earth in 1959 in a photograph sent by the US satellite Explorer 6, whereas the first to see it first-hand was the Soviet cosmonaut Yuri Gagarin (1934–1968) in 1961. The Earth is the third planet in the solar system, counting from the centre, and the fifth largest and, what is more, the densest planet in this system. It takes 365 days and 6 hours for the Earth to rotate around the Sun. The Earth formed about 4.54 billion years ago from a concretion of a cloud of cosmic dust. With its magnetic field and the atmosphere that protect against solar radiation and smaller meteorites, the Earth is unique. It is the only known planet on which there is water in liquid form. This resulted in life to develop there, including Homo sapiens and thousands of other living things. The Earth, just a tiny grain of dust in the Universe, is the only home for about 7.5 billion people who can enjoy its blue sky and green fields; its forests, mountains, rivers, lakes and seas; its glaciers, deserts and volcanoes; its heavenly peace and ravaging storms. A special coincidence of necessary conditions has given rise to the miracle, which is life. 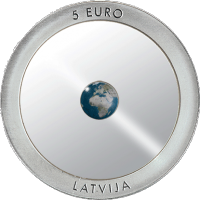 The symbolic Earth at the centre of Latvijas Banka's collector coin "The Earth" points to its place in human values and its existential integrity. The jewel-like Earth is enclosed by a transparent diaphanous veil. It represents the Universe where the planet Earth is floating as an island of life.